When is the last time you thought of the planet Mercury? 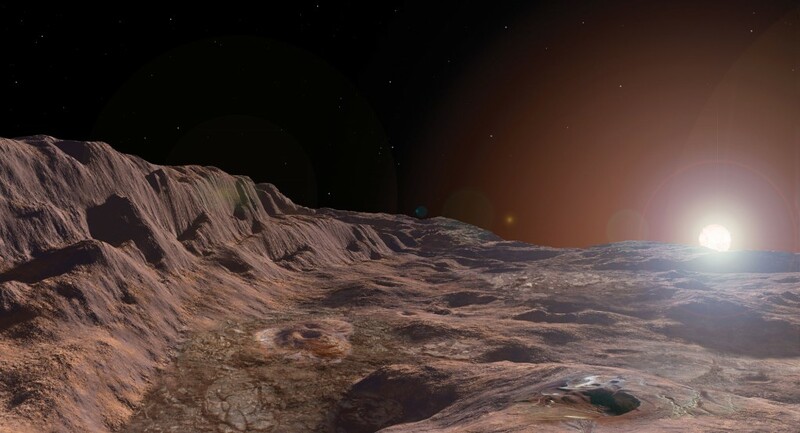 That smallest of planets, closest to the sun and ever hiding behind the skirts of dawn or dusk, is easy to overlook—out of sight, out of mind. But Mercury has been on scientists' minds for some time now and subjected to close scientific scrutiny by NASA's MESSENGER spacecraft for the better part of a decade. Mercury is a world of wonderful extremes. It is the closest planet to the sun, the smallest planet of the solar system, and also one of the densest. In fact, owing to its density, tiny Mercury's surface gravity is about equal to that of the larger Mars. It is thought that as much as 75% of Mercury's radius may account for a very large, iron-rich core. Mercury experiences day and night temperature swings ranging from colder than -300 to hotter than 800 degrees Fahrenheit--the largest range in the solar system. Named for the Roman messenger god, Mercury is the speediest planet, zipping around the sun in only 88 days at speeds ranging from 24 to 36 miles per second. And, in stark contrast to this short orbital period, Mercury's slow rotation of 176 Earth days makes for very, very long days and nights. But for all of its fascinating characteristics and its relative closeness to us, Mercury had been one of the least explored planets of the solar system, receiving only three fleeting flybys by the Mariner 10 spacecraft in 1974, which revealed to us only half of the planet's surface, and gave us the impression that Mercury might be very similar to Earth's Moon. NASA's "MErcury Surface, Space ENvironment, GEochemistry, and Ranging" (obviously, someone at NASA really wanted this acronym to spell out "MESSENGER") spacecraft finally gave us a better look a decade ago when it arrived at Mercury, revealing that the resemblance to our Moon is truly only skin deep. Unlike our lightweight Moon, Mercury possesses a massive iron core, and currents within its molten portion generate a strong global magnetic field, not unlike Earth's protective magnetosphere. Mercury's surface composition is also quite different, its surface rocks containing far less iron and far more sulfur than the Moon. And though both Moon and Mercury are covered with impact craters (the main reason for their superficial resemblance), Mercury also possesses an abundance of "lobate scarps," a telltale geographic feature formed by global contraction. Perhaps one of the more unexpected and fascinating finds on Mercury is indication of the presence of—believe it or not--water ice. Mercury lacks any significant atmosphere, which means that although daytime highs soar, when its surface slowly rotates to the shade of night, temperatures plummet. This in itself does not foster the existence of permanent water ice, for even if ice somehow appeared during the long night, it would evaporate come day again. However, because Mercury's axial tilt is nearly zero, conditions at its poles, particularly at the bottom of crater floors, do harbor pockets of permanent shadow, in which ice could persist—and there is compelling evidence of significant ice deposits. MESSENGER will soon deliver its final message to us. Its rocket propellant tanks nearly depleted after years of orbital maneuvering, NASA has engaged this spacecraft in a so-called "hover" campaign, in which MESSENGER is descending closer and closer to Mercury's surface and obtaining the highest resolution imagery and other data of its entire mission. NASA's plan is to get every last bit of science out of MESSENGER as it descends, until the moment that it impacts Mercury's surface and decisively ends its mission in a flourish of fireworks that no one will see. When it collides with Mercury's surface, MESSENGER will have joined a very small "club" of spacecraft from Earth that have physically contacted other bodies in the cosmos. This "Touchdown Club" includes: numerous robotic and human-crewed spacecraft that have landed on the Moon; a large and growing number of landers and rovers that have set down (intact or in pieces) on Mars; a similarly decorated corps of heat-resistant robots on Venus; the Galileo spacecraft, which first sent an atmospheric probe into Jupiter's cloudtops, and then added itself to this short list in an end of mission flame-out; Cassini's Huygens probe on Titan; the NEAR spacecraft on the asteroid Eros; and finally, and most recently, the partially successful landing of Europe's Philae probe on comet Churyumov-Gerasimenko. 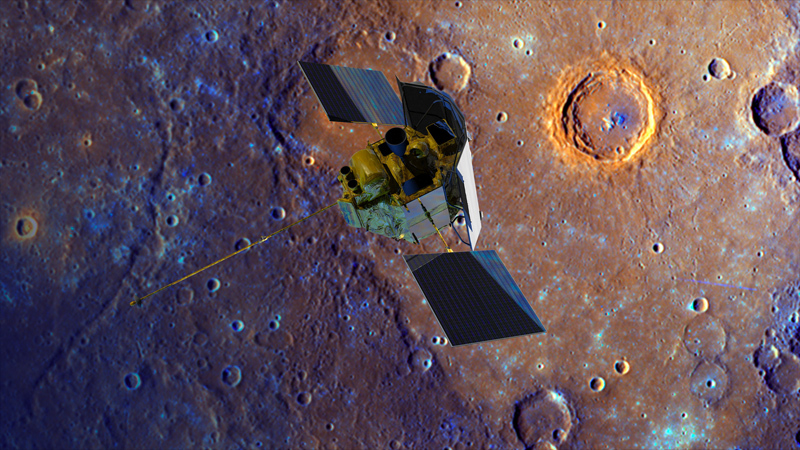 Good luck, and farewell, MESSENGER!